I went to the Brockenhurst Needlework Fiesta this morning. There was an exhibition of local embroidery, lace making, spinning and weaving, quilting and patchwork, bead work and other crafts and 3 rooms full of needlework traders selling beads, fabric, silk, books, daylight bulbs, paper, felting supplies and lots lots more. Gill from The Woolly Workshop was there so I took the opportunity to introduce myself as Gill sends me monthly email updates because I bought some of Annarella’s stitch markers from her once. It was lovely to meet her and put a face to the name and it was just as nice to get to squeeze and fondle some Cherry Tree Hill Supersock Merino as I’ve never had the chance before. 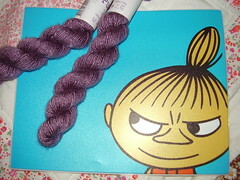 It isn’t itchy for me so I’ve decided to buy two skeins of the Wild Cherry shade to knit another Demeter camisole. I think the colour will go really well with a skirt that I bought last month and then when I got home realised that I didn’t have a single top that went with it. It is a sort of muted rose pink print on a darker pink background with red and black embroidery and the rose pink coloured buttons. I’ve worn it with a red top, black cardigan and black boots but in the summer I’d like to have a vest/camisole style top to wear with it and I think the Wild Cherry is the one. I’m also hoping that because the pattern was written for a merino sock yarn that the lace at the bottom will stay blocked if I knit it in the correct type of yarn!! I also bought some bits of silk to make some fabric postcards, I have a sewing machine that I don’t use enough so I want to have a play with it. 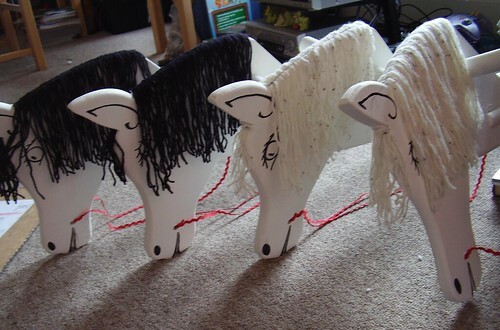 We had activities at work on Wednesday to celebrate St George’s Day and part of my role in it was to put manes on these wooden hobby horses last Sunday. I got my sewing machine out and attached lots of yarn to a strip of tape so that I could glue it to the horses for their manes. The first one was a bit of a pain to do as the yarn kept moving as I sewed it but I got the hang of it in the end and Voila! four hobby horses for a race between senior managers! 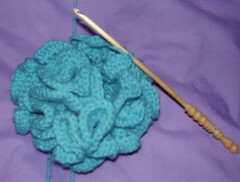 Work for me was very hectic this week so I haven’t made any progress on the crocheted coral at all. I did get my order of Pure Silk so that I could continue with my Juno Regina, I have started at the other end with skein 3 and will graft it together at the end so that I can use as much of the yarn as possible. It’s lovely to knit with and feels wonderful. I just hope I can block it well enough. Last night I finally got around to having a play with the purple yarn my mum bought to knit a jumper for me, I knitted a sort of swatch and attempted some cables. I personally don’t think the cables stand out that well so I have decided not to use this yarn to make the Rogue Hoodie as I had planned. Instead I’m going to attempt to knit a plain stocking stitch jumper in the round using the Elizabeth Zimmermann percentage system (EPS) and it will be my “if you’re cold put on a sweater, that’s what they are for” jumper. I planted some sunflower seeds last week and LOOK! seedlings. I’m very proud as I’m not very good at growing things usually. I just hope I manage not to kill them for awhile. Well, what do you think? 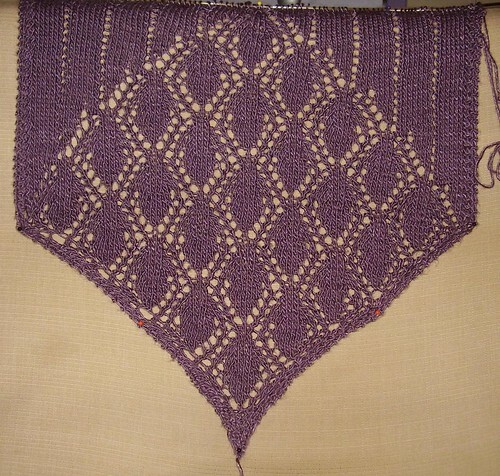 It’s my Juno Regina by Miriam Felton knitted in Debbie Bliss Pure Silk shade 24. 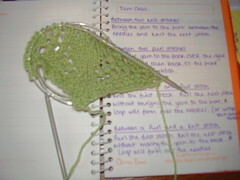 I started it on Sunday and I’m really enjoying knitting it. I didn’t at first, I started it on Sunday morning and it just wouldn’t work so I undid it and put it aside for a few hours. During which I went for a walk whilst listened to some knitting podcasts and then made a necklace and earrings out of some black/white/red beads that I bought at The Bead Shop on Tower Street, near Covent Garden last week. And THEN I was ready to re-attempt the Juno Regina, and this time I had obviously found my mojo as it worked really well. I knitted all evening until quite late and barely stopped to make some food! The pattern is great, it’s not too easy but once I’d got the hang of double yarn overs and how to knit both bits of them in the next row it was just nice to knit. The silk yarn is lovely, so soft and drapey I can’t wait to block it. I realised on Thursday that 3 skeins is definitely not enough to make it a sensible length. If you look at the top right corner of the picture you can see some yarn ends because that is where I started the second skein, so I’ve had to do some shopping around on the net to find somewhere to buy 2 more skeins so it’s long enough. I will learn from this mistake, I promise. I sometimes have to cover reception at work during breaks and I’d recently started taking my lunchtime knitting with me (usually socks) but this week I decided to crochet a hyperbolic coral reef to send to the iKnit London knitting group as they are making them for charity. I think it’s too increase awareness of the coral reefs being destroyed around the world. So on Friday I sat on reception happily crocheting a twirly bundle in turquoise acrylic yarn and loved the look on people’s faces when they said “what are you knitting?” and I replied “it’s crochet not knitting, and I’m making a coral reef”. At the moment it looks more like one of those netty-sponge washing things for showering that you get in Boots/superdrug. Hello!!! I’ve had a very knitty week, it’s been really great. I didn’t get any other craftiness done unfortunately as I had a throat infection aswell and there was definitely no cycling involved – too tiring. Typical, only I would get properly ill when off work. Nevermind I went to the docs and started taking a course of penicillin really quickly as I didn’t want being ill to spoil my week. Let me see what have I done this week…. First there was a trip to Get Knitted where I bought 3 skeins of Debbie Bliss Pure Silk in a wonderful shade called Soft Purple, 3 pig buttons for the baby jumper and one ball of Tofutsies (just because it was on sale). I also looked at Colinette Jitterbug and Koigu as I don’t seem to itch much around merino wool – I think it may be the answer to my wanting to knit in wool problem. Then I had no excuse not to finish the baby jumper in green so I grafted the left shoulder together and picked up stitches around the neck. The pattern then said cast off. Just cast off, no knitting just cast off. Well I do not like picking up stitches and it usually takes me quite a while to get the right amount even for a small item like a baby jumper so I wasn’t just going to “cast off”. 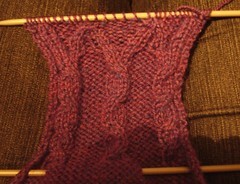 I knitted two rows and THEN I cast off. 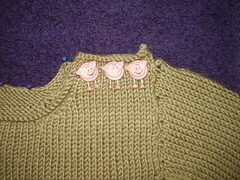 It looks fine and because of the cute pig buttons on the shoulder it won’t make the neck too tight. I’d been calling it “jumper for Piglet” as Claire has been calling her bump “piglet” for most of her pregnancy, and now I’ve aptly renamed it The Three Little Pigs jumper, you’ll see why when I post a picture. It’s been blocked and is sooooooooooo soft it’s lovely – but it is Sublime Cashmere Merino Silk so it should be. 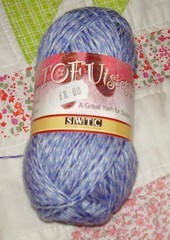 I will put it in the post on Monday and it’s perfect timing as Piglet is due to arrive on Wednesday. I’ve chosen a pattern to knit with the soft purple silk, I was torn between the Cleopara Wrap from the Sensual Knits book by Miriam Felton, the Tuscany wrap in No Sheep For You by Amy R Singer or the Juno Regina wrap in Knitty also by Miriam Felton. I looked at all three patterns and finally decided on Juno Regina as I like the diamonds on the ends and because you only have to cast on 3 stitches. I’ve practiced with some spare DK yarn as the silk is DK and the size/gauge seems to be ok. I did have a slight issue with yarn overs but after some research on ravelry today I’m fairly confident I can attempt the pattern now with the silk yarn. I could do yarn overs between knit stitches but near purl stitches or what to do with knitting double yarn overs just threw me completely. All sorted now though. My trip to London was a complete success, inspite of the weathermen/ladies insisting it would rain the weather was lovely all day. I took out my knitting on the train and it prompted comments and then conversation from the three ladies sat at my table so I was completely chuffed about that and I made good progress on some socks for mum. The American Scene exhibition at the British Museum was really interesting, it was prints from the first half of the 20th century and showed american architecture and life in general. I love the British Museum, especially the staircases around the central reading room. I had a wander around Covent Garden, met a nice family in Starbucks, bought lovely beads in the bead shop on Tower Street, got a book in Forbidden Planet, some nice loose tea in The Tea House on Neal Street, a Little My mouse mat and Totoro stamp in Magma on Earlham Street, two knitting magazines in Borders and spent 30 mins sitting on the floor in the knitting section reading while killing time before I met up with Nic. After work Nic met me at the London Eye and we walked around the back of Waterloo Station to iKnit London’s new shop to go to their weekly knitting group. Neither Nic or I had been to a knitting group before and we both really enjoyed it. It was exactly how I had envisioned it, lots of people sat around knitting and chatting. The shop was smaller than I thought but big enough for 20 people to sit and knit in!! Look pics of Thursday! Some of the ladies were doing hyperbolic crochet for the Institute of Figuring’s Crochet Coral Reef Project whilst others were knitting their own projects. I just wish I lived closer so that I could go more often. It’s really inspired Nic and I to start up our own knitting group in Salisbury. I bought an Addi circular needle to knit Juno Regina and I’m so pleased with how nice it is to knit with. The cable doesn’t twist at all unlike some of my other circular needles. I got home at 10pm after a really nice day and it started to rain as I walked in the door – perfect timing! I’m off work now for 9 whole days! I’m not going away so I’m looking forward to a relaxing week at home just pootling about. Mum and I will be having a yarn buying spree at Get Knitted on Monday, Tuesday morning I’m getting my head shorn as I haven’t had a haircut since before Christmas and it is really scruffy now. I’m really bad at remembering to book an appointment. Thursday I’m going to London for the day (knitting on the train) and will probably go to the Tate Modern or V&A, do a bit of shopping and then meet my friend Nic for the iKnit London knitting group at 6pm near Waterloo. The rest of the week will involve lots of knitting and crafting I hope plus walks and I may even get my bike out for the first cycle of the year – but not tomorrow as it’s supposed to snow in the UK. I’ll believe it when I see it to be honest. This week I’ve been working late and therefore needed some pretty mindless knitting in the evenings to relax with so I started and finished the black and white striped scarf I mentioned a couple of weeks ago. I cast on 300 stitches so I could knit it longways and it’s worked out quite well. 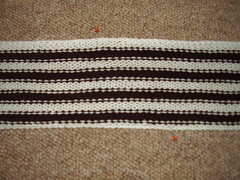 I did 4 rows of each colour for the stripes and knit it on a 4.5mm 100cm circular needle. 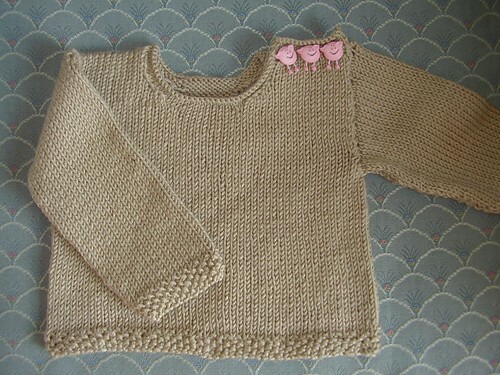 There are only about 32 rows and I finished it last night at midnight (after many “I’ll just knit another row”s). It needs blocking (pic above) and the ends sewing in as it’s all curly the wrong way so the purl side is showing. As it’s 50% bamboo 50% cotton it won’t be too warm but it will keep me warm enough. I just hope I can get it to lay flat. Burton Scarf update: it won’t stay flat but I’m getting used to it. I am still contemplating adding some embellishment as it was inspired by Tim Burton and all the stripiness in his films so I think it needs some curls or spirals as that is another theme he likes.